Ten years ago today (Monday, June 30), NASA made history as the Cassini spacecraft became the first human-made satellite of Saturn – beginning an orbital tenure that has altered planetary scientists’ thoughts on the “habitable zone” and life-sustaining areas of the solar system. What would ultimately become the Cassini-Huygens mission dates to the early 1980s when the National Academy of Sciences in the United States and the European Science Foundation came together to investigate the potential of cooperative missions. The venture quickly suggested a joint Saturnian orbiter and Titan lander mission. The following year, 1983, the Solar System Exploration Committee of NASA recommended a similar joint Saturnian orbiter and Titan lander mission. Throughout 1984-5, NASA and the European Space Agency (ESA) jointly investigated the feasibility of such a mission; however, after 1985, NASA backed out of the joint mission, which continued forward, in a study capacity, via the ESA. By 1988, then-NASA Associate Administrator for Space Science and Applications agreed that NASA would commit to a Saturn mission with ESA as long as ESA chose the Cassini mission from the three missions under consideration. As much as the Cassini-Huygens mission is about science, it is also very much a formation-solidifying mission of cooperation and equality between NASA and ESA. In the preceding years to 1988, ESA and NASA had developed a strained relationship because of NASA’s inequitable treatment of ESA during previous partnership missions. Cassini-Huygens would be the mission to correct this relationship. With joint NASA and ESA funded secured, spacecraft design and construction began following the selection of the primary mission objectives. In all, Cassini-Huygens mission scientists developed seven primary objectives that could be reasonably met within the planned four Earth-year duration of the primary science mission. Those objectives were to determine the three-dimensional structure and dynamic behavior of the rings of Saturn; determine the composition of the satellite surfaces and the geological history of each object; and determine the nature and origin of the dark material on Iapetus’s (third-largest moon of Saturn) leading atmosphere. Further mission objectives included the measurement of the three-dimensional structure and dynamic behavior of Saturn’s magnetosphere; the study of the dynamic behaviors of Saturn’s atmosphere at cloud level; the study of the time variability of Titan’s clouds and hazes; and the characterization of Titan’s surface on a regional scale. In collaboration with ESA, NASA took responsibility for assembly of Cassini at the agency’s Jet Propulsion Laboratory – the same center that would manage the mission. 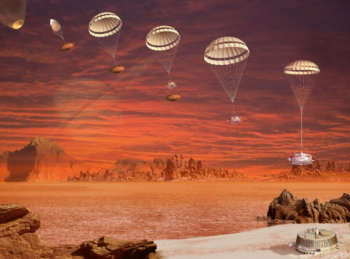 ESA would conversely be responsible for building a fare number of Cassini’s constituent parts, as well as nearly all of the Huygens Titan lander (save the batteries and two scientific instruments from NASA). Once assembled, the Cassini-Huygens spacecraft was 2,500 kg in mass (with Huygens accounting for just 350 kg of that mass), 6.8 meters in height and 4 meters in width, and included 14 kilometers of wiring, 22,000 wire connections, and 1,630 interconnected electronics components. To power all of Cassini’s systems, as Saturn is too far from the sun to effectively use solar power, NASA designed a 32.7 kg plutonium-238 power source – with electrical power derived from heat from the material’s radioactive decay. Huygens was then designed to use this same power source while in transit to Saturn, transitioning to chemical batteries for deployment, entry, and landing on Titan. With the Launch Vehicle Adapter and 3,132 kg of propellant at launch, Cassini-Huygens stands to this day as the largest and most complex unmanned interplanetary spacecraft ever built. NASA’s decision to power Cassini with plutonimum-238 led to a higher-than-usual interest in the probe’s launch – specifically from protesters who turned out to draw attention to, what they called, reckless behavior and public endangerment by NASA. At the core of their protests was the idea that millions of people in Central Florida would be in danger of radioactive poisoning in the event of a launch failure. The claims were quickly discounted by NASA and the U.S. Department of Energy. For NASA’s part, the agency had designed Cassini’s Radioisotope Thermoelectric Generators (RTGs) to withstand intense heat, heat that might be encountered during a launch failure. Prior to Cassini’s launch, several dozen protesters were arrested for violating government-controlled facilities, throwing pieces of carpet at guards, and attempting to climb over security fences. In the end, NASA proceeded uninterrupted toward launch. Cassini-Huygens lifted off without issue atop a Titan IV (401) B rocket from Space Launch Complex 40 at the Cape Canaveral Air Force Station, FL, on 15 October 1997 at 04:43.00 local time (08:43.00 UTC). The Titan IV-B rocket delivered Cassini into a multi-planet encounter, heliocentric orbit, beginning the near 7-year cruise to Saturn. Cassini-Huygens performed two gravity assist flybys of Venus on 26 April 1998 and 24 June 1999, and one gravity assist flyby of Earth on 18 August 1999. On 23 January 2000, Cassini-Huygens performed an unexpected flyby of asteroid 2685 Masursky – an encounter which mission controllers used to help further calibrate Cassini-Huygens’s cameras (following initial calibrations during the Earth-Moon flyby). 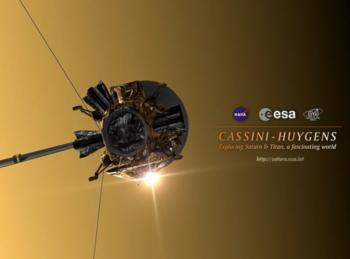 The Jovian encounter occurred on 30 December 2000, providing the final gravity assist maneuver to place Cassini-Huygens on course to rendezvous with Saturn. This observation contradicted previous hypotheses about Jupiter’s dark and light belts and served to highlight differences in planetary weather systems. During the flyby, Cassini was also able to study Jupiter’s thin ring system. Observations from Cassini showed that Jupiter’s rings were composed of irregularly shaped particles that likely originated as ejecta from micrometeorite impacts with the moons Metis and Adrastea. Following encounter with Jupiter, Cassini-Huygens enjoyed a smooth cruise to Saturn. 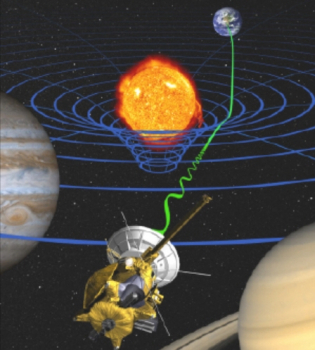 During this cruise, mission scientists revealed the results of Cassini’s test of Einstein’s Theory of General Relativity during periods when radio waves in transit from Cassini to Earth passed near the Sun. By measuring the shift in these radio waves as they passed near the Sun, scientists were able to verify the predicted result of General Relativity. General Relativity states that an object as massive as the Sun causes space-time to curve. Thus, a radio wave passing close to the Sun will have to travel a greater distance as it travels around the curvature. The experiment using Cassini verified the predicted General Relativity model to within one part in 51,000 – the most accurate measurement to date. In the final few weeks leading up to Cassini-Huygens’s arrival at Saturn, instruments and cameras aboard Cassini began continuous observation of the Saturnian system – observations that yielded the detection of three unknown moons. By 11 June 2004, Cassini had performed its first Saturnian moon flyby when it encountered Phoebe (for the first and only time due to orbital mechanics of the mission). The encounter provided fresh and highly detailed images of Phoebe, leading scientists to realize that the moon probably has large amounts of water ice under its proximal surface. As Cassini got closer to Saturn, it was able to identify something peculiar about the planet’s rotation rate: It was different from Voyager 2’s observations in 1980. In fact, the rotation rate was 6 minutes longer than previously observed. Since there are no permanent, solid features on Saturn, scientists calculated the planet’s rotation rate on observable radio waves emanating from the planet. The different rotation rate observed by Cassini was determined to be due to the latitude at which those waves emanated. Finally, 30 June 2004 arrived: Saturn Orbit Insertion day. The insertion of Cassini into orbit of Saturn would prove historic not only because it made Cassini the first spacecraft to orbit the planet, but also because of the highly dangerous route Cassini had to take through Saturn’s rings. On 30 June 2004, Cassini oriented itself with its high-gain antenna facing away from Earth and along the vehicle’s flight path to shield its instruments from the particles in Saturn’s rings. Crossing through the gap between the F and G rings, Cassini transited the rings of Saturn and came through the crossing without damage. The probe then reoriented itself, with its high-gain antenna toward Earth and its engine along the flight path. Cassini then fired its engine – a maneuver designed to slow the spacecraft by 622 meters per second to allow Saturn to capture it. With the maneuver complete, Cassini was officially captured by Saturn’s massive gravity field at 20:44 Pacific Daylight Time on 30 June 2004 – 03:44 UTC on 1 July 2004. Just one day after arriving at Saturn, Cassini-Huygens performed their first flyby of Titan. Approaching to a distance of 339,000km, Cassini’s cameras and instruments peered through the methane clouds to reveal a south polar surface of different brightness – indicating areas of river and drainage channels on the surface of the moon. 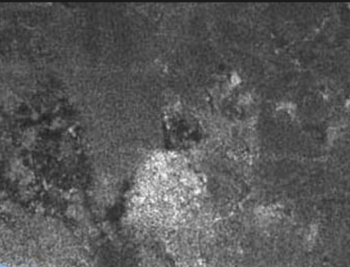 A subsequent flyby (just 1,200km above the moon’s surface), produced the first radar images of Titan’s surface. The radar images showed a relatively smooth surface – paving the way for the Huygens mission. On 25 December 2004, Huygens detached from Cassini, and on 14 January 2005, the probe entered Titan’s atmosphere for descent to the moon’s surface. During the descent and landing, Huygens transmitted 700 pictures to Cassini (350 of which were transmitted to Earth). As the craft descended by parachute through the atmosphere, it gathered information on winds, cloud composition, and general atmospheric characteristics. After a 2.5hr descent, Huygens successfully touched down on the surface of Titan – marking the first (and to date only) landing ever accomplished in the outer solar system. 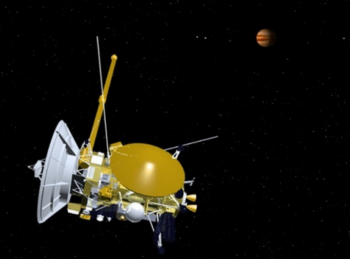 Surface characteristics were analyzed, and while indications that chucks of water ice were present at the landing site, the surface features were determined to be clay-like (because Huygens displaced a rock during its landing) and sandy with a thin layer of methane haze. 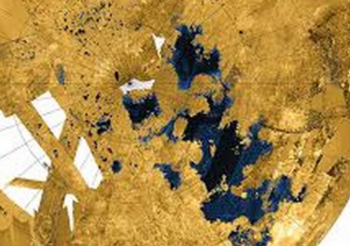 Information from Huygens seemed to suggest that while liquid definitely played a role in the shaping of the local terrain, actual collections of liquid methane and hydrocarbon lakes probably were not currently present on Titan’s surface. That determination from Huygens data was categorically disproved by the 100 subsequent flybys of Titan by Cassini. In 2007, Cassini made the unprecedented discovery of huge, permanent lakes and seas of liquid methane, ethane, and propane in the polar regions of the moon. The discovery confirmed a long-standing hypothesis and marked Titan as the only other place in the solar system (aside from Earth) with (known) permanent, ambient temperature liquid lakes and seas on its surface. Throughout its decade of Titan observations, Cassini has further confirmed the presence of methane rain and season floods on Titan. Cassini completed its 100th flyby of Titan on 6 March 2014. Despite the amazing finds and confirmations at Titan, the standout surprise of the Cassini mission has been the moon Enceladus. Since arriving in 2004, Cassini has confirmed that Enceladus is the likely cause of the E-ring of Saturn – forming the E-ring through eruptions of water vapor from cryo-geysers at the southern polar region of the moon. The discovery of potential water vapor eruptions from Enceladus quickly catapulted Enceladus up the list of places to examine in more detail. Cassini’s orbital characteristics were tweaked to send the probe through the vapor ejecta from Enceladus on 12 March 2008. The flyby confirmed the presence of water, carbon dioxide and various hydrocarbons in the ejecta – furthering the growing hypotheses that Enceladus harbored a subterranean ocean. 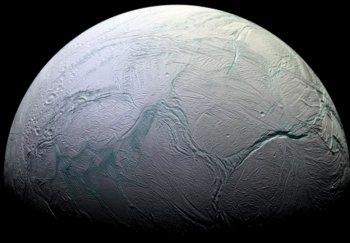 Subsequent flybys between 2009 and 2012 confirmed that Enceladus harbors a large, salt-water ocean beneath its surface – a confirmation announced by NASA in April 2014. As the final year of the primary science phase of the mission (2008) arrived, NASA requested additional funded for the continuation of the Cassini mission. 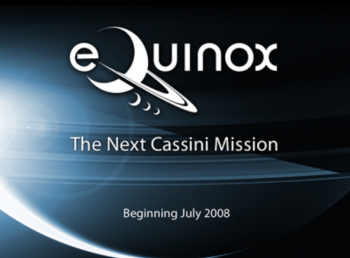 On 15 April 2008, Congress approved a 27-month extension of the mission and additional funds for the Cassini mission through September 2010. The mission, called the Cassini Equinox Mission, allowed the probe to make 60 additional orbits of Saturn and observe the planet’s (and Titan’s) changing weather features as they transitioned through the Saturnian equinox (August 2009) and as the seasons changed across the hemispheres. Additionally, 21 more flybys of Titan were added to the mission, as well as seven more flybys of Enceladus. As the end of this mission extension drew near, another mission extension proposal, through 2017, was submitted to Congress and approved with appropriations. Cassini’s mission, in 2010, was once again renamed to the Cassini Solstice Mission – as extension of the mission to 2017 would allow mission scientists to observe Saturn through its upcoming northern hemisphere summer/southern hemisphere winter solstice in May 2017. As Cassini’s arrival in 2004 was just a few months after the planet’s northern hemisphere winter solstice/southern hemisphere summer solstice, Cassini operations through 2017 will allow scientists to observe the planet and its moons through almost one-half of Saturn’s orbit of the Sun. Moreover, the extension through 2017 will allow for (from year 2010) 155 more orbits of Saturn, 54 more flybys of Titan, and 11 more flybys of Enceladus. Beginning in May 2005, Cassini spent four months making radio observations of Saturn’s rings. As Cassini passed behind Saturn and her rings (in relation to Earth), the probe transmitted radio waves through the rings, a process called radio occultation. When those signals were received at Earth, they help scientists determine the composition and structure of the ring system. Continued observation of the rings also confirmed the spoke phenomenon first observed in 1977 and then by the Voyagers in 1980. Cassini also imaged vertical structures in the rings for the first time, helping to reveal that Saturn’s rings are dynamic in nature, and active – a laboratory for how planets form (and moons, with 2014’s discovery of the on-going formation of a new moon of Saturn from the rings). 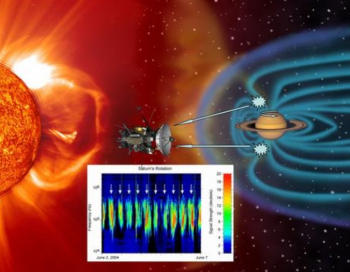 Cassini has also revealed that radio wave patterns from Saturn are not tied to the planet’s interior rotation as previously thought (the rotation phenomenon discovered prior to spacecraft arrival and followed up on during nominal orbital operations). Fulfilling one of the mission’s primary objectives, Cassini has also solved the mystery of the dual, bright-dark surface features on the moon Iapetus. The 2007 flyby of Iapetus allowed scientists to hypothesize that the dark material is residue from a major sublimation event, or evaporation of water ice to vapor (skipping the liquid stage), on Iapetus’s surface. Further exposure to sunlight then darkened the surface to what we see today. Additionally, for Cassini, the probe has studied in great detail the formation of the new Great White Spot in Saturn’s northern hemisphere. Known since 1876 (why they were not detected prior to 1876 is unknown), the Great White Spot of Saturn was first observed by Asaph Hall. The storm was named the Great White Spot in analogy to Jupiter’s Great Red Spot. During the 1876 observation, Hall was able to use the Great White Spot to calculate Saturn’s period of rotation. Following the disappearance of the 1876 Great White Spot, the storm has reappeared, on average, every 28.5 years in Saturn’s northern hemisphere only (why it never occurs, or has never been observed, in the southern hemisphere is unknown). For Cassini, the sudden and somewhat unexpected early appearance of the Great White Spot in the current cycle (it was not predicted to appear until 2016), allowed for detailed study of the storm. To date, Cassini has observed a loss of acetylene in the white clouds, an unusual temperature drop at the center of the storm, and an increase of phosphine. Cassini has also observed multiple eruptions of the storm, one of which caused a 150 degree F temperature spike above the ambient atmospheric temperature. At the same time, ground-based observations on Earth detected a significant increase in ethylene gas, a colorless and odorless gas that is highly uncommon on Saturn. The spike in ethylene reached quantities 100 times greater than thought possible on Saturn. 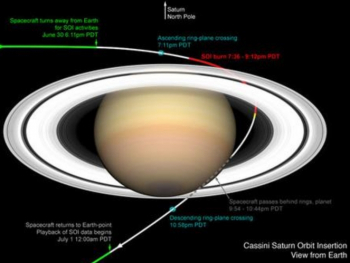 However, the Great White Spot has not been the only storm observed by Cassini on Saturn. In 2006, Cassini discovered a hurricane-like storm at Saturn’s southern pole. The storm had a distinct eyewall – a common characteristic of hurricanes on Earth, and a phenomenon never-before seen on another world. Unlike hurricanes on Earth, the Saturn hurricane is stationary, measures 8,000km across and 70km in height, and has winds reaching speeds of 560kph (350 mph). “It’s incredibly difficult to sum up 10 extraordinary years of discovery in a short list, but it’s an interesting exercise to think about what the mission will be best remembered for many years in the future,” said Linda Spilker, Cassini project scientist. Since its arrival at Saturn, Cassini has been commanded through 2 million orders, collected 514 GB of scientific data, travelled 2 billion orbital miles, taken 332,000 photographs, and performed 291 engine burns. Even before it arrived (and since), Cassini has discovered seven moons of Saturn, performed 132 close flybys of Saturnian moons (over 100 of which have been flybys of Titan), and completed 206 orbits of Saturn. With scientists from 26 nations participating in the mission, Cassini has generated an impressive 3,039 published scientific papers. 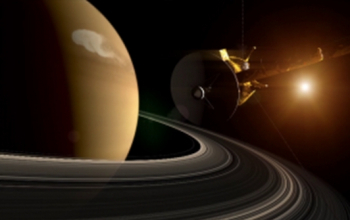 At present, Cassini’s mission is slated to last until 2017. At this point, Cassini will conduct a final flyby of Titan that will purposefully and irrevocably alter its orbit to send the probe into a destructive entry of Saturn’s atmosphere, destroying the probe and ended the mission while maintaining the highest standard of planetary exploration: non-contamination of extraterrestrial worlds (in this case, the potential life harboring moons of Titan and Enceladus).